The Fat Quarter Shop and Tula Pink have teamed up to present you with a Fat Quarter Shop Exclusive! Tula Pink has specially selected 12 prints from her Prince Charming collection along with 3 coordinating Free Spirit Designer Solids for this special bundle you will only find at the Fat Quarter Shop. A: I chose these designs and colors because they remind me of a warm spring rain. The day I made the selections was the first rain of the season, a light sprinkle and the first spot of sun after a long winter. It was the perfect palette for the day. One of the 3 statements is false. Comment on this post telling me which statement you think is false. Answer correctly and you have a chance to win Tula Pink's Designer Select Fat Quarter Bundle! 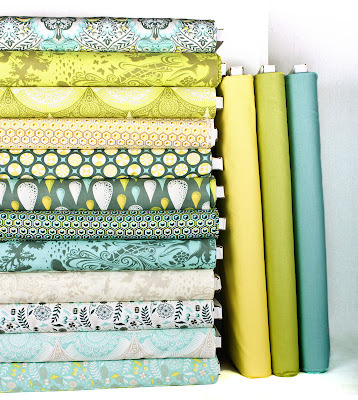 We will now be featuring our favorite designers in exclusive Fat Quarter Shop Designer Select Fat Quarter Bundles. You can even join our club and get a bundle shipped to you for each item! Our future designers include Ann Kelle, Sweetwater, Me & My Sister Designs, Kate Spain, Bunny Hill Designs, Bonnie & Camille and Fig Tree Quilts.